Change is underfoot in the cryosphere. Permafrost that has been frozen for tens of thousands of years in the Arctic, and for millions of years in the Antarctic, is beginning to thaw. The implications are both fascinating and alarming. According to the 2017 Arctic Report Card released last week by NOAA, warming temperatures and rapid change are the “new normal” for the Arctic region. One such rapid change is thawing permafrost. Permafrost is ground that remains at or below 0°C for at least two years. It contains soil, rock, ice, and organic material. As temperatures in the Arctic rise-at twice the rate they are rising elsewhere-Arctic permafrost, which underlies nearly a quarter of the land surface in the Northern Hemisphere, is beginning to thaw. As the ice contained in permafrost melts, and organic matter that had been frozen within it for tens of thousands of years begins to decompose, things start to change quickly. There are visible changes, like land collapse, which threatens communities and infrastructure, and alters hydrology and ecology. There is also a quieter, less visible, but equally ominous change – the release of greenhouse gases. Arctic permafrost is estimated to contain twice as much carbon as is currently in the atmosphere. As permafrost thaws, that carbon, along with methane, is released into the atmosphere, and areas long-relied upon as carbon sinks become carbon sources. How fast is permafrost thawing, and how will it impact global climate? How is it impacting remote Arctic communities and regional ecology? What can we do about it? We explore these questions and more with Dr. Sue Natali of the Woods Hole Research Center’s Arctic Permafrost program. 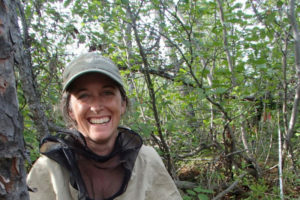 Sue is not only studying the effects of climate change on arctic ecosystems and the consequences of these changes for carbon cycling, she is actively cultivating a much-needed next generation of permafrost researchers. Permafrost is not limited to the Northern Hemisphere. It is found in the Patagonia region of South America, New Zealand’s Southern Alps, and all of Antarctica’s exposed land, and it is thawing there, too. Though it contains less carbon than in the Arctic, Antarctic permafrost holds clues to climates dating back eight million years. 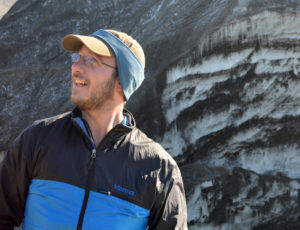 To find out what we can learn from Antarctic permafrost, and what we stand to lose as it thaws, we caught up with Geologist Joe Levy of Colgate University before he heads to Antarctica for his latest research endeavor. Communicating the reality, relevance, and urgency of a situation occurring in such remote regions of the world requires more than scientific papers. Fortunately, there are many resources available on the topic, and some creative outreach efforts underway. In this issue, we highlight one of them: a new, immersive exhibit at the Oregon Museum of Science and Industry that allows people to experience what it is like to walk into Alaska’s Permafrost Tunnel Research Facility and see and smell 40,000-year-old permafrost. Might the impacts of thawing permafrost present new opportunities for design? In her article, Trekking across Alaska: A new vision for a changing landscape, ecological planner/designer Jennifer Dowdell explores an intriguing concept that responds to changing market and permafrost conditions: the Trans-Alaska Trail. In her article Boreal Sounds, senior engineer Erin English introduces us to an artist whose music transports us to the landscapes and communities of the Far North. Seattle-based Boreal Taiga invites us to experience the north in a new way by forging aural connections to place, opening the door for a deeper understanding of the impact of climate change on remote regions. Leaf Litter’s Non-Profit Spotlight shines on the Alaska Institute For Justice, an organization dedicated to the rights of all Alaskans-including those living in communities where relocation is the only viable long-term climate adaptation strategy. 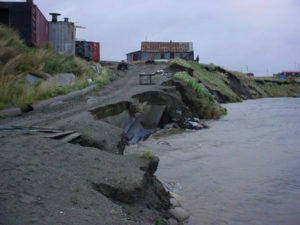 They are currently working with Alaska Native communities on the front lines of climate change to build a framework for relocation governance that will ensure the protection of human rights. Water resources engineer Meghan Gloyd reviews the 2012 film Chasing Ice. This documentary tells the compelling story of environmental photographer James Balog’s efforts to capture a multi-year photographic record of melting Arctic ice. In Biohabitats Projects, Places, and People, we invite you to meet the newest members of our team, learn what we’ve been up to, and find out where we’re headed in the coming weeks. As always, we want to know what you think. Contact our editor to share your thoughts, reactions, or suggestions for future issues of Leaf Litter.